Robin R. Yount (/ˈjɒnt/; nicknamed,"The Kid", and "Rockin' Robin", born September 16, 1955) is an American former professional baseball player. He spent his entire 20-year career in Major League Baseball as a shortstop and center fielder for the Milwaukee Brewers (1974–1993). After growing up in California, Yount spent a couple of months in minor league baseball and advanced to the major leagues at the age of 18. He won two American League Most Valuable Player awards. In his best season, 1982, the Brewers made a World Series appearance. In 1999, Yount was elected to the Baseball Hall of Fame in his first year of eligibility. Since his retirement as a player, Yount has held several roles as a baseball coach. Yount was born in Danville, Illinois. Yount lived briefly in Covington, Indiana, but his family moved to southern California when he was an infant; his father had gotten a job testing rocket engines with Rocketdyne. Robin attended William Howard Taft High School in Woodland Hills. Yount was the third pick overall in the June 1973 Major League Baseball draft, one slot ahead of fellow Hall of Famer and 3,000 Hit Club member Dave Winfield. Yount made his major league debut the following April, at eighteen years old. After going hitless in his first four games, Yount hit a game-winning home run in his sixth. Yount is currently the last 18-year-old to hit a home run in the Major Leagues (Andruw Jones and Bryce Harper are the two most current teenagers to have hit Major League home runs, but did so as 19-year-olds). On September 14, 1975 (two days before his 20th birthday), Yount broke Mel Ott's 47-year-old record for most games played in the major leagues before turning 20. Yount courted controversy in the winter of 1978. He threatened to retire from the game and take up professional golf rather than be underpaid or moved to the outfield by the Brewers. Early in the season, Paul Molitor was called up from the Brewers Class A affiliate to the major league team because of Yount's absence. Yount's demands were met; when he returned to the team, Molitor was moved from shortstop to second base to make room for Yount. He was an early proponent of weight training – then uncommon in baseball – and by 1980 Yount's power hitting had improved, particularly for a shortstop. Yount was an All-Star in 1980, 1982, and 1983. No other Brewer was voted a starter in consecutive years until Ryan Braun started each year between 2008 and 2011. Yount led the American League with 210 hits in 1982. The 1982 AL East race was tied on the final day of the season, with the race coming down to a winner-take-all game between the Brewers and the Baltimore Orioles. With the title on the line, Yount hit home runs in each of his first two at-bats against Orioles starter Jim Palmer. Yount finished with a four-hit game, as the Brewers won 10-2. In addition to his only 200-hit season, he registered career highs with 29 home runs, 114 RBI, and a .331 batting average (.001 behind the league leader, Willie Wilson). Yount finished with a .578 slugging percentage and .957 OPS on his way to gaining 367 total bases – leading the major leagues in all three categories. His slugging percentage was the second highest ever by a shortstop, and his 129 runs set the record for that position. That year, Yount also won his only Gold Glove Award and his first Most Valuable Player Award. His performance garnered 27 of 28 possible first place votes in the 1982 MVP balloting. The year ended with the Brewers making their only World Series appearance. Although Yount became the only player in history to have two 4-hit games in one World Series, Milwaukee lost to the St. Louis Cardinals in seven games. Yount batted .414 in the Series, with one home run and 6 RBI's. In 1985, a shoulder problem forced Yount to move to the outfield. After splitting time between center field and left field, Yount became the Brewers' regular center fielder in 1986. He played more than 1,200 games in the outfield in his career, with a .990 fielding percentage. He made a game-ending, diving catch to preserve a no-hitter by Juan Nieves early in the 1987 season. Yount narrowly won a second MVP Award in 1989, making him only the third player to win MVPs at two positions, joining Hank Greenberg and Stan Musial (Alex Rodriguez would later join this group). Yount was the first AL player to win multiple MVP's in over twenty-five years, since the Yankees' Roger Maris (1960 & 1961) and Mickey Mantle (1956, 1957, and 1962). Yount collected more hits (1731) in the decade of the 1980s than any other player. 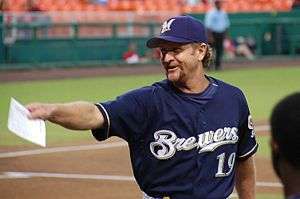 Robin Yount's number 19 was retired by the Milwaukee Brewers in 1994. After the 1989 season, Yount was a free agent and he spoke with several teams about contract offers. The California Angels were prepared to make a serious offer, but Yount signed a three-year contract with the Brewers worth $9.6 million in February 1990. In 1991, Yount was briefly on the disabled list (DL) with a kidney stone, only the second stint on the DL in his career; the first one was in 1978. On September 9, 1992, Yount collected his 3,000th career hit, becoming the 17th player (and the third youngest) to reach the mark. He announced his retirement after the 1993 season. The Brewers retired his number the next year. Yount was elected to the Wisconsin Athletic Hall of Fame in 1995. He was elected to the Baseball Hall of Fame in 1999, his first year of eligibility. That same year, he was included in the balloting for the Major League Baseball All-Century Team, finishing fifth among shortstops. Yount holds Brewers career records for games, at-bats, runs, hits, doubles, triples, RBIs, total bases, walks and strikeouts. He was the last active major leaguer to have been a teammate of Hank Aaron (1975–1976). He posted a career .285 batting average with 251 home runs, 1632 runs scored and 1406 runs batted in. His 11,008 career at-bats is the seventh-most in Major League Baseball history, and he ranks 17th on the all-time hit list. His three All-Star appearances are tied with Ferguson Jenkins for the second-fewest of any Hall of Famer from the post-All-Star Game era, and he won a second MVP Award in 1989 without making the All-Star Team. Yount served as first base coach and bench coach for the Arizona Diamondbacks from 2002 to 2004. He resigned after the dismissal of Arizona manager Bob Brenly. He, Hank Aaron, Warren Spahn and Bob Uecker threw out the ceremonial first pitches at the 2002 Major League Baseball All-Star Game at Miller Park. In 2005, Brewers manager Ned Yost convinced Dale Sveum, a teammate of Yount's, to become Milwaukee's new third base coach. Yount followed suit a few weeks later, accepting a post as the Brewers' bench coach. In November 2006, Yount announced he would not return to the team as bench coach for the 2007 season. However, on September 15, 2008 Sveum, by now the team's manager, chose Yount as his bench coach. In 2012, when Sveum was named the Chicago Cubs new manager, rumors quickly spread that Sveum would ask Yount to coach with him, even though the Brewers and Cubs had become bitter rivals. Sveum very quickly confirmed that he was not even considering such a move. As of 2014, Yount is a special instructor in spring training for the Brewers. Yount met his wife Michele at Taft High School and they have been married since 1979. Yount's brother Larry was a pitcher and was briefly called up to play in the major leagues. While taking his warmup tosses for his debut as a Houston Astros reliever in 1971, he experienced elbow pain. He never threw an official pitch in any MLB game. Yount's son Dustin played baseball in the minor leagues for several years. Yount's nephew Austin Yount played professional baseball for the Dodgers organization. Another nephew, Cody Yount, played college baseball for Pepperdine University. Since retiring from baseball, Yount has increased his participation in two of his other passions, professional motorcycle and auto racing. In June 2008, Yount announced the creation of a new all-natural lemonade drink, Robinade. A portion of the proceeds of the sales goes to charity. Yount sometimes goes hunting with Sveum. While hunting in Arizona in 2012, Yount accidentally shot Sveum with pellets in the back and ear. Sveum's injuries were minor. In 2012, Yount became a minority owner of the Lakeshore Chinooks of the Northwoods League, a collegiate summer baseball league. The Chinooks play at Kapco Park at Concordia University Wisconsin where the right field fence is 319 feet in his honor. ↑ Sondheimer, Eric (July 23, 1999). "Robin the Bat-man". Los Angeles Times. Retrieved August 8, 2014. ↑ Dominguez, Fernando (February 12, 1994). "'Boy Wonder' Yount Drew a Crowd at Taft". Los Angeles Times. Retrieved January 16, 2015. ↑ Okrent, Daniel (2000). Nine Innings: The Anatomy of a Baseball Game. Houghton Mifflin Harcourt. p. 47. ISBN 0547527527. Retrieved August 8, 2014. ↑ "Robin Yount Statistics and History". Baseball-Reference.com. Retrieved September 29, 2011. ↑ "Yount Wins AL MVP". Brewers1982.com. PastKast. Retrieved September 29, 2011. ↑ "Baseball Awards Voting for 1982". Baseball-Reference.com. Retrieved September 29, 2011. 1 2 3 "The Ballplayers – Robin Yount". BaseballLibrary.com. Retrieved 2008-12-13. ↑ "National Baseball Hall of Fame and Museum". Retrieved 2012-06-11. ↑ Penner, Mike (December 20, 1989). "Losing Yount keeps Angels a step behind". Los Angeles Times. Retrieved August 8, 2014. ↑ "Names in the news". Los Angeles Times. February 21, 1990. Retrieved August 8, 2014. ↑ "Brewers place Yount on the disabled list". The New York Times. July 16, 1991. Retrieved August 8, 2014. ↑ "The 3000 Hit Club: Robin Yount". Baseball Hall of Fame. Retrieved August 8, 2014. ↑ "Brewers to mark 20th Anniversary of Robin Yount's retirement as a player". MLB.com. August 2, 2013. Retrieved August 8, 2014. 1 2 "Robin 'The Kid' Yount returns to Brewers". USA Today. November 4, 2005. Retrieved 2008-10-03. ↑ "Yount reveling in another postseason". Retrieved 2008-10-03. ↑ Pesetski, John. "Yount springs into action, imparts wisdom on Brewers in spring training". Fox Sports. Retrieved August 8, 2014. ↑ Hunt, Michael (September 11, 1992). "Unassuming star puts family at top of hit list". Milwaukee Sentinel. Retrieved August 8, 2014. ↑ Brazzle, Ken (April 22, 2009). "Yount sees Toros as new shot at displaying his skills". Tucson Citizen. Retrieved August 8, 2014. ↑ Dare, Chad (June 3, 2009). "Retracing his roots". The Commercial-News. Retrieved August 8, 2014. ↑ "Robinade – Old School Lemonade". Retrieved 2008-10-03. ↑ "Cubs manager Dale Sveum shot by Robin Yount in hunting accident". The Sporting News. December 5, 2012. Retrieved August 8, 2014. ↑ "Chinooks' first season is home run".